Is F-35 right for Britain? It's that time of year again. May has swiftly come around, and it seems like only yesterday that we were bidding the 2014 season a fond farewell. 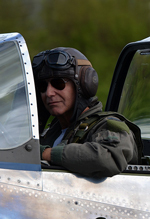 The bank holiday saw no less than three airshows of varying degrees take place across the country, with the hallowed ground at Old Warden being one of them. 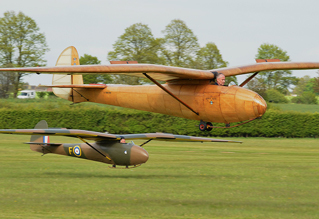 Certainly, both the Shuttleworth and Abingdon shows in May are much-loved fixtures in the airshow calendar, due in no short part to their presence being a firm declaration that the airshow season is finally here. 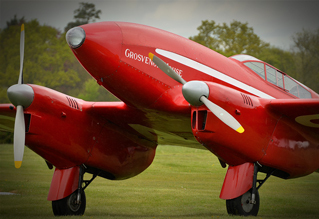 Tom Jones reports from the Shuttleworth Collection's season opener for UK Airshow Review. Typically, last month was the sunniest April on record. Four weekends of perfect weather couldn't extend to the bank holiday, and as a result Old Warden suffered its fair share of grim elements much like the rest of the UK. Somewhat shamefully, this was my very first experience of Old Warden, and like many, many others who have popped their Old Warden cherry recently, most definitely not my last. Arriving quite leisurely in the late morning with no queues to get in and armed with a £5 programme, the weather was decidedly less than clement. We've all been there at one time or another; the unremarkable uniform grey cloud and wispy drizzle often does much to dampen the mood upon arrival. Luckily, like Duxford and to a certain extent Cosford (though on a much smaller scale than both of the aforementioned venues), Old Warden has a fantastic collection of interesting aeroplanes, and plenty of hangar-space in which to shelter. Luckily, as the day wore on the weather did end up playing ball, at least for a while, and by the time the flying display started, the crowd bathed in some glorious spring sunshine. John Romain began the Old Warden display season at an immaculate pace with a blistering display in the Duxford-based Hispano Buchon. 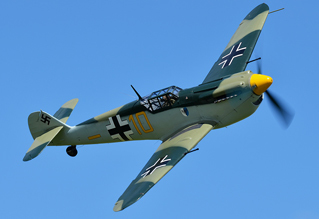 Oft overlooked at other shows, the Buchon with the much-loved display pilot at the controls grasped the crowd's attention with power, grace, poise and topsides aplenty. Romain made excellent use of the famed "dog-leg" display line, and wringed the "one faux nine" for all she was worth. It was certainly one of the best warbird displays I have seen for some years. It was also great to see the Polikarpov Po2 "Kukuruznik" get some air beneath her wings, and it's a truly exceptional machine. As the only one flying in the UK out of a staggering 40,000 built, she appears to be immaculately looked-after by those volunteers at Shuttleworth, much like the rest of the collection. 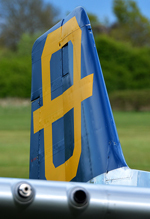 The Battle of Britain Memorial Flight suffered their fair share of problems over the weekend, with three out of their four aircraft pencilled in unable to attend. However, we were treated to a solo display of their Spitfire Mk.Vb AB910 including, rather unusually from them, a few well-flown topside passes. Further displays came from an Anson and Spartan formation, the Collection's Sea Hurricane, Piston Provost and Gladiator. Peter Teichman made an appearance in his P-51D Mustang "Jumpin' Jacques", including landing at the show, and immediately jumping out to speak to those in the crowd. These machines all flew against the backdrop theme commemorating the 70th anniversary of "VE Day". With such a broad and encompassing theme, the organisers managed some rather original set pieces, from the Spartan Executive, and the type's history of pre-war photo reconnaissance of German positions (including one flight with a none-the-wiser Hermann Goring in the front seat! ), to a Fieseler Storch being engaged by a US Piper Cub and a subsequent aerial ballet with service revolvers which is oft cited as one of the final dogfights on the western front in World War Two. Why are these original set pieces so important? Because the crowd can learn from them, and hear the lesser-told but no-less important anecdotes of history. This, to me, underscores one of the principles of flying historic types aside from as tributes, and that is to educate people. There was much trepidation about the advertised Hawker biplane formation. Duxford's Nimrod, for one reason or another, hadn't managed to make the short hop to Old Warden previously, and with nervous glances at the approaching storm clouds, many in the crowd were wondering if, yet again, fate would not be on our side. Those fears were calmed with the distinct sound of the Kestrel V engine as the biplane appeared out of the approaching gloom. After several formation passes, each aircraft broke into their own respective solo display, with the Nimrod rounding the segment off with an extremely low and fast topside pass. It was such a shame that by this point the heavens had opened over the Bedfordshire countryside, with most of the crowd having retreated behind umbrellas or into cars. To me, one of the true marks of airshow organisation is how bad weather is handled. It was printed in the programme that the Edwardians, WWI aircraft and WWII trainers would be out on show. Sadly, the weather appeared to have put paid to those intentions. Those losses were almost immediately forgotten, however, when the immaculate DH.88 Comet, "Grosvenor House" was towed out of the hangar and sat in front of the crowdline. Indeed, even the rain was almost forgotten when "Dodge" Bailey took off and commenced his display with a signature topside pass. Sadly, the Comet was displayed in what must have been the worst conditions of the day, but equally, it was also excellent to see (and hear) the machine stretch its legs, and to know that the Collection is confident enough to display the machine in less than clement conditions. A weather forecast is just that, and considering the predictions before the show, it would be fair to say that we were lucky to come off as dry as we did. However, as I said earlier, we've all been there when the elements have closed in, the sun has disappeared, and the commentator is repeatedly apologising for cancelled acts and "updating the situation". So it takes something remarkably special, to distract from that, and keep crowds smiling. Somehow Shuttleworth, and the venue's intimate little atmosphere, managed it in spades. 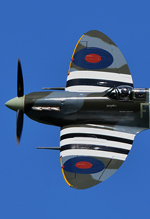 At £22.50 per ticket, it may not be the cheapest airshow to attend, but with such well-flown displays, charismatic aircraft and where every machine displaying is rightly given pride of place, one could do a lot worse for a season opener. If it's possible to be re-bitten by the aviation bug, Shuttleworth would be the place where the magic would, and frequently does, happen.